The ebb and flow of a lifelong oil and water unchecked friendship. 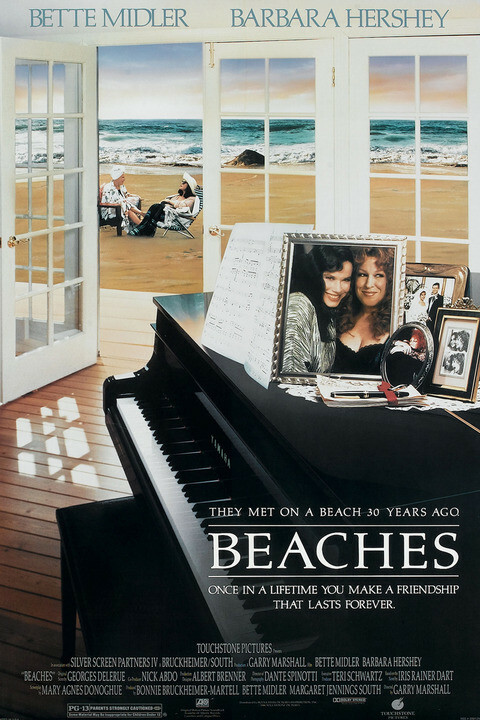 Touchstone Pictures’ Beaches is the timeless modern classic that is the bittersweet story of the friendship between the most unlikely of friends. Much like Universal Pictures’ Fried Green Tomatoes, Beaches tells two stories: the present day one concurrent with dozens of flashbacks that show the evolution of the friendship between Broadway actress turned pop-star C.C. Bloom (Bette Midler) and wealthy old money Californian Hillary Whitney (Barbara Hershey). Unlike the former, the latter does not play the flashback card as artistically and cinematically as well. Despite the fact that I, along with hundreds of thousands of fans, adore this film immensely, as a film critic, I cannot ignore the blatant misuse and misplacement of the flashback. However, this movie is special in that it can make even those of us who have seen it dozens of times cry every time. I think this is because that the friendship, that is displayed through the narrative, is one that many of us wish we had. Interestingly, this quintessential late 1980s movie is closely aligned with the plots of 1940s friendship sagas complete with feuds, tearful reunions, and fatal illnesses. Beaches takes us on a journey from the Boardwalk of Atlantic City to the rocky shoreline and beaches of the San Francisco area. Follow unlikely friends Hillary Whitney (Hershey) and C.C. Bloom (Midler) through the mountains and valleys in their lifelong cross-country relationship. Hillary is a girl of impeccable breeding from a wealthy San Francisco family and C.C., an aspiring Broadway child star from the Bronx. After a chance meeting under the Boardwalk, Hillary and C.C. quickly form a lasting friendship built over the course of hundreds of letters back and forth over the years. With both women being strong-willed and stubborn, it is of no surprise that their friendship is one of jealously, competition, and resentment–however–they are always there for each other. As adults, they spend time traveling from coast to coast and despite the valleys, they always return to the mountain peak. Due to the very lifelong-friendship movie cliches in the narrative, the audience is usually way ahead of the characters on the screen. Despite this utterly predictable plot, the audience is sucked in at the same time because of the personalities of the characters and the magic that both Midler and Hershey bring to their respective roles. The movie is pretty well straight forward and seldom deviates from what is typically expected of melodramas. It is up to Midler and Hershey to hold the attention of the audience, much like actors on a stage, because the writing and directing is very par for the course. I would venture to say that if the two lead actresses were replaced by any two other performers, that the movie would most likely not have the high place amongst modern American dramas that it does in the library of American cinema. The Divine Miss. M’s musical talent is definitely showcased quite well in the movie, and is one reason the movie has stood the test of time that it has. For the last nearly three decades, scores of best friends have cried together while painting each other’s toe nails and drank lots of wine while watching this go-to film. Although bordering on unrealistic expectations of a lifelong friendship, the movie successfully shows us how even the best of friends can argue, fight, and still return to each other in times of need. There is something to be said about a friendship that can stand the trials and tribulations that this one does. Although Beaches lacks the spontaneity of real life, and is nearly completely constructed out of other movies, it has and will continue to be one of those films that epitomizes the idea of devoted friends and dedication to a relationship. And, who doesn’t love “The Wind Beneath My Wings”?? ?